Have you ever wondered what supplements actually do for your body? 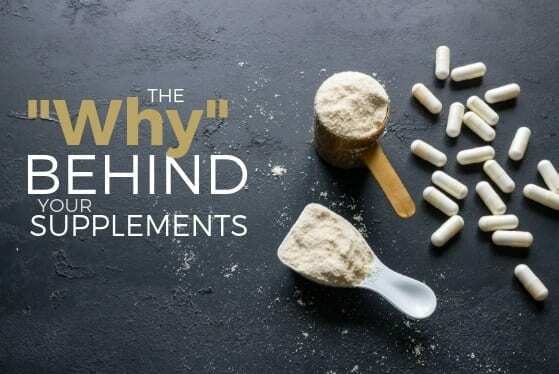 This may seem like an obvious question, but knowing the “why” behind your supplement is important. Understanding the benefits and purpose behind the supplements you are taking can increase your adherence, therefore speeding the healing process, and potentially decreasing the length of time you are on that supplement. Here is a list of some of the most commonly utilized supplements at Cornerstone Health Community and how they support your body in the healing process. 5-HTP: A precursor to serotonin, a brain neurotransmitter associated with the feeling of well-being. It has been shown to support patients with mood changes, restless sleep, and anxiety. Adren-All: Helps the body to resist the negative effects of stress and fatigue. Adrenevive: Provides stress resilience and helps to reduce elevated cortisol levels. AlphaBase: Highly absorbable multimin and multivitamin to provide comprehensive nutrition support. Bergamot BPF: Cardio protective by lowering cholesterol without side effects. CDG EstrDIM: Lowers elevated estrogen levels. Cerenity: Increases serotonin and GABA production to combat stress and anxiety. CereVive: Provides building blocks for GABA, serotonin, and dopamine, in order to combat depression and anxiety. C-Flav: Augments vitamin-C deficiency which is an important nutrient for healthy immune function and tissue repair. Collagen: Provides building blocks for cartilage, tendon, ligament, fascia and skin. CoQ10: Improves energy production, as well as heart health, and immune function. Cystistatin: Contains Uva Ursi to retard bacteria that cause urinary tract infections as well as SIBO (small intestine bacterial overgrowth). Digestzyme-V: Enzymes designed to support digestion and aid nutritional absorption. DHEA: Supports communication between the brain and the adrenal glands; promotes healthy hormonal balance and mood regulation. D-Hist: Natural anti-histamine that does not cause drowsiness. Fiber Plus: Good tasting soluble and insoluble fiber. Glutashield: Reduces inflammation and speeds the healing of the gut lining. IgG Protect: Strengthens protection from chronic infection and reduces potential for autoimmunity. Inflamma-BLOX: Traumeric and other herbs that powerfully lower inflammation throughout the body. InflammaCORE: Reduces inflammation throughout the body and speeds repair of gastrointestinal tissues. K-force: 5,000 IU of vitamin D3 with ideal amounts of vitamin K2 for bone health and protection against arterial plaque. Lipoic Acid: Supports liver for detoxification and increases levels of glutathione. Liposomal Glutathione: Powerful detoxifier, for mycotoxins, heavy metals, medications, and much more. Melatonin: Aids in regulating sleep cycles. Methyl B12: Significant source of B12 and folate needed by those with MTHFR mutations. Methyl B-complex: Contains eight essential B vitamins, choline, inositol, and folate to support energy, mood, and sleep. Methyl CPG: Supports methylation and reduces homocysteine in the body. MitoCore: Supports energy and immune function especially for those with chronic viral infections. N-Acetyl-Cysteine: Increases glutathione levels and breaks biofilms needed for detoxification. Ortho B-complex: Includes eight essential B vitamins to support methylation and carbohydrate metabolism, and to protect against stress-induced nutrient depletion. Orthobiotic: Probiotic with 20 billion CFU of healthy bacteria plus saccharomyces boulardii. Orthobiotic “100”: High dose probiotic containing 100 billion CFU per capsule. Orthodigestzyme: Blend of enzymes used to support healthy digestion and maximize nutrient support especially for those with high protein or high fat diets. Orthomega 820: A highly purified, highly absorbable oil from fish, particularly helpful to control inflammation. Orthomega DHA Select: Highly purified omega 3 oil with increased DHA to improve neurologic function and mood. Phosphatidylserine: Lowers cortisol at bedtime and through the night to maximize sleep and tissue repair. Pregnenolone: Supports the stress response system as well as mood. Probiotic 225: High dose probiotic providing 225 billion CFU per dose. Pyloricil: Prevents reinfection by H pylori bacteria or to suppress symptoms until beginning treatment. Reacted Iron: Readily absorbed iron with less constipation. Reacted Magnesium: Has over 300 uses in the human body; improves bowel regularity; regulates heart rate; decreases muscle cramps; improves sleep; decreases anxiety; aids in detoxification. Reacted Multimin: Broad-spectrum mineral support for a variety of functions, including quality sleep and tissue repair. Reacted Zinc: Highly absorbed zinc to improve immune function and gene expression. Resvoxitrol: Enhances antioxidant activity protecting cells from damage due to toxins. Saccharomyces boulardii: Beneficial yeast that improves immune function, reduces inflammation, and can prevent C. Diff infections. SBI Protect: Purified, dairy-free source of immunoglobulin G (IgG) providing protection from chronic infection and reducing autoimmune potential. Sinatrol: Reduces chronic inflammation of sinus membranes. Viracid: Powerful activation of immune response to viral infections. Wholemune: Recruits immune cells to fight bacterial infections. For more information on these supplements as well as nutrition fact information you can visit OrthoMolecular’s website.